Harry Potter and the Sorcerer's Stone trivia game is a clever and challenging contest that mixes a burst of classic Harry Potter with the basic game rules of Trivial Pursuit. Work your way around a circular track and answer questions from one of five categories. There will be plenty of obstacles along your way. In the end you must return to Hogwarts House to answer one last question. Harry Potter and the Sorcerer's Stone trivia game is definitely for the Harry Potter fans out there, but there are helpful hints for those who aren't quite so Harry Potter knowledgeable. For all you Harry Potter fans out there, Harry Potter and the Sorcerer's Stone trivia game is the perfect game for you. To be the Harry Potter and the Sorcerer's Stone Trivia game champ you must be the player who can race around the board the fastest collecting charms. Then you'll need to head back to Hogwarts for one last question. Answer this question correctly and you'll be the Harry Potter and the Sorcerer's Stone Trivia game champion! 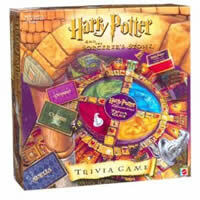 Your Harry Potter and the Sorcerer's Stone Trivia game should come with game board, a 6-sided die, four sorting hat cards, six mover pieces, fifty of each: charm cards, spell cards, and curse cards, eight double-sided house/legend cards, trivia box with question cards, and the complete Harry Potter and the Sorcerer's Stone Trivia rules and instructions. Please keep in mind that the official Harry Potter The Sorcerer's Stone Trivia party rules and instructions could be different depending on the game version you have. The rules below are some of the exact directions on how to play Harry Potter The Sorcerer's Stone Trivia. Share with us your comments, funny stories, tips, advice, strategies, creative ways to play, questions about how to play, problems with the rules or anything you want about Harry Potter The Sorcerer's Stone Trivia. All submissions will be reviewed within 24 hours. Click here to add your Harry Potter The Sorcerer's Stone Trivia comments.